Dolls delight me. They're forever on my mind. It's so insanely obvious, i do suppose, that i hardly need to even mention it. Dolls are such precious, beautiful things, and at the same time, strange. Some folks will tell you that dolls actually scare them, that there is something inherently 'creepy' about their lifeless yet perfect little eyes, hands, and mouths. I have never quite understood this, but i do accept that it is a common reaction, and that many do not share the same fascination as i do for what is obviously the most frequently used motif in my body of works - and quite as likely, one of the primary forces that drive it ! Tragically, it is such a tiny file size that i cannot imagine it making a decent print, but i am secretly fond of it, regardless. I was quite unused to using the techniques that are so like second nature to me nowadays. As a child i was almost as fascinated by dolls as i am today, but in a wholly different way. I wasn't so much interested in them as playthings or pretend babies; i was more inclined to perceive them as something akin to little 'models' that i could manipulate, dress, invent stories around, naming them, exploring my own world through them...sometimes playful, sometimes not so! I sometimes wonder if we still have a sort of magical connection to dolls, which might be termed 'primitive' in the sense that they are symbolic of the human figure, the human being, yet not quite human at all. I'm thinking now of certain essays or stories i have read (at some time or another) that make use of the idea of dolls as objects that we somehow imbue with life via imagination, or focus (or love, especially in the case of a child). This is apparent when you recall certain stories and films that have used dolls in much the same way, particularly ghost stories and horror films, like those about the 'possessed' doll (don't mention chucky to me!) or worse, the ventriloquists dummy *shudder* !!! See Dead of Night for the quintessential example. But on the lighter side of the fence, we have examples such as the Tapestries story (mentioned in a previous post) which utilises a similar yet refreshingly wholesome theme. Instead of the doll leading a reign of terror, we have the doll revealing a reign of terror (caused by humans), that will eventually bring revelation, truth and acceptance to the young, female protagonist. 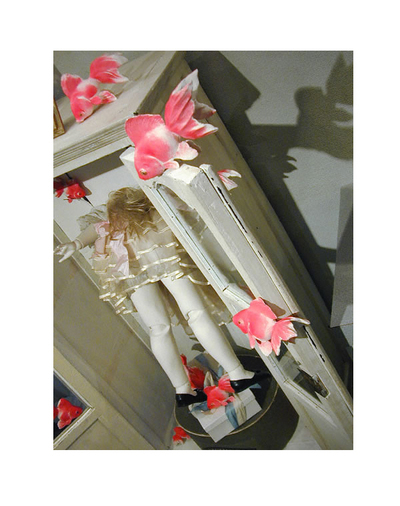 So what is it that intrigues us, that fascinates so many of us about dolls? Well, my guess is that they allow us to express ourselves, encouraging the joys of imagination, make-believe, wonder. Aside from their obvious craftsmanship and beauty, they are so amazingly full of potential: we put something of ourselves into them, whether we are using them as works of art, sculpting them from scratch, writing about them, customising them, or simply collecting them. In many ways, you might say that this is very much the same as what a child might do in play; exploring, inventing, acting-out, resolving, refining, and redesigning reality. 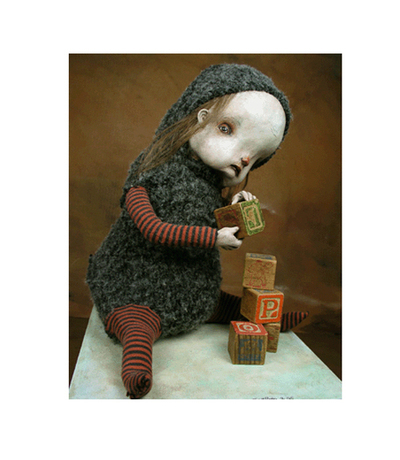 Perhaps those of us who love dolls have simply never lost the ability to play - or to explore our demons. I have always thought this in relation to my art work. It is a continuation of my exploration of myself and the world around me. My toys are my tools and techniques, my flights of imagination are as powerful and convincing as those that engrossed me as a child. I love these with a passion! Porcelain, china paint. 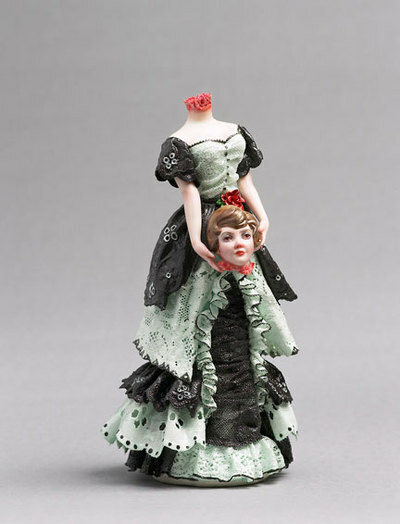 20cm tall (doll sculpture) by Shary Boyle. I want each and every one of them to come and live with us at the Artandghosts Circus! Just imagine how perfect that would be. But alas, i cannot work out if they are for sale or not. To anyone fluent in the language, please help me!!!! Wow, there are some amazing dolls listed above. I love the Noriko Okamura dolls. I'm not sure if I want to hug them or bury them!! AND... I know that I continue to repeat myself when I say that I am in true awe of your photo manipulations/digital collages. How desperately I am hoping to sell a few more of my pieces so that I can purchase one of YOUR pieces!! Soon....very soon. AND... Thank you so very much for including me as a link to your "dolly delights". I must say that I am flattered yet knowingly I am an obvious underling to the other doll makers in your "dolly delights". 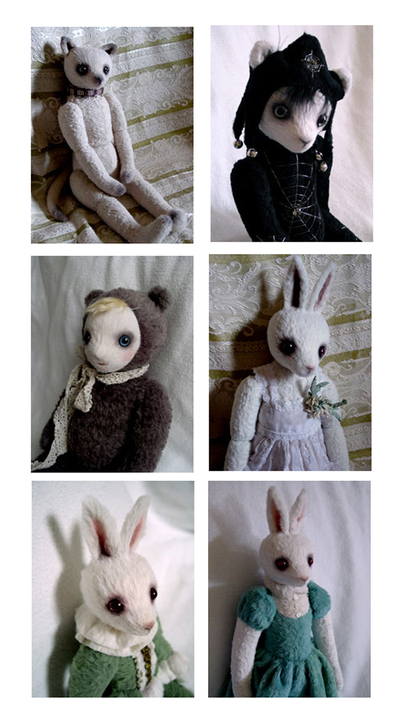 But, nevertheless, I am happy to see my name included in such a stunning list of doll makers. This was a lovely post on dolls. I love them all. Those rabbit dolls would be most delightful included in your art. I am glad that you mentioned garboodles as I am quite taken with her lovely dolls. I loved this post! And I am utterly amazed, inspired, delighted and tickled pink (or actually more of a dusty-rose hue) over Noriko Okamura's dolls....They make me want to cuddle, laugh and cry all at once! I've never seen any of these artists before! THANK YOU for sharing such amazing talent! Those bunny dollies are like your bunny characters made solid! That's uncanny. Ventrilloquist dummies creep me out! I remember hiding my face from the commercials for the movie 'Magic' as a child. Permanently scarred. Dollies exist in that dreamlike state of unreality. They are extensions of our psyches. They can be as fantastical or as mundane as our minds. Amazing dolls...my mother collected dolls when I was growing up, and while they were amazing and beautiful, only a handful were my favorites. I ususally reserved my favorite postitions for animals that I could dress up as people! Such a WONDERFUL post!! I could talk about Dolls for days and never run out of things to say. Very fine examples that you posted photos and links to! Scott RAdke being one of my favorites! What a sense of imagination and such deep character in his creations. Of course I can't leave out the Dolls of Yore and Garboodles dolls. They are my friends as well as two of my favorite artists! Hello ! I've just get a photograph of you received in my letter box, a gift from a friend for my birthday, it's the one with the two birds in a bath, now, I'll search a beautifull frame for put it on my desk, so that I would be able ti dreams during my work :) Thanks for your presence. Oh what a beautiful post!! I am feeling so inspired by dolls at the moment - actually I guess I always have been but it is only now that I have the time to fully pursue the fascination! I adore the work of Scott Radke which I discovered a couple of years ago - the details are incredible . I am also currently inspired by the stories by Angela Carter - now there is some doll and character imagery to dream about!! thanks for all of your contributions! Oh how I do feel that way. Your expression of words is beautiful. I love all the different dolls here you posted. I have always had a dliking of Different. Your work by the way is absolutly gorgeous. I am in awwww with what you can do with manipulation of the pictures. Truely delightful. Thanks for adding me to your dollie list too!!! How sweet that you like them too!!! Talk to you soon!!! i just adore those noriko dolls! so cool. and thanks again for mentioning tapestries. this was inspired by an actual doll i found in my mother's closet a few years ago. i had never had quite the attachment to dolls i think. i was more fond of stuffed animals with whom i could invent stories. we had some barbies whose feet i would chew off and which were the cause of many fights with my sisters. maybe we used them to project our frustrations of each other. i never found dolls creepy either, i just grew bored of them quickly. i saw my sister play mommie with them and that just wasn't my thing. i see now the importance of playing out the troubles we had and have but also just as a personification of that little soul we each of us have and to make her speak, because she is hard to visualize in the abstract. i see momo as this for you and i love her for that... maybe someday i will find one for me. for now, i have only just heard her voice. thankyou Teresa - your dolls astound me, truly! Maren - we must co-write something similar at the cottage, or at least put it into motion, what do you say? get over here tomorrow! I really love this post too! I like dolls a lot, and especially yours! Your dolls and prints are absolutely amazing! I am on the side of dolls scaring me too, but still love them! Bluemoonstudio has a link to your blog and Etsy shop. I had seen your rabbits before which I just adore. WOW! what incredible images, all of them...just eye candy!!! Thanks for all the listings. 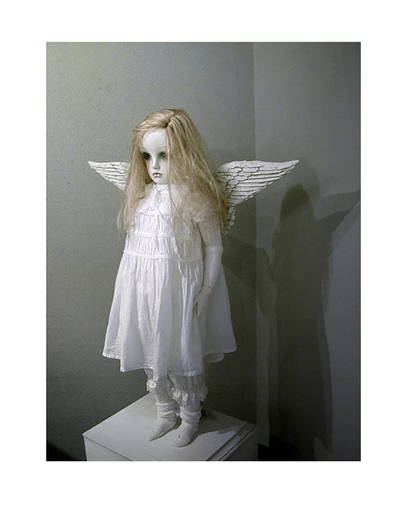 I love strange dolls works. I can't wait to save up and get one of my own.